38 September / October 2014 Elearning! Learning! 100 PGA of America: Helping Golf Pros Sell Fun in a Safe Environment Te PGA of America's 27,000 men and women professionals make it the largest working sports organization in the world. As promoters of the sport of golf, they have begun a training regime that targets selling the game as much as playing the game. Tis new thrust is in response to fat or declining play on courses from coast to coast. "Golf has been a little fat over the recent years due to some of the eco- nomic issues the whole world has faced," observes Dawes Marlatt, senior direc- tor of Education and Employment. "To intervene, we've taken a more consumer- facing approach to help our professionals better understand the buying behaviors of our consumers." PGA of America cites three issues learned from consumers that were barri- ers to their commitment to golf: 1 Time: Te commitment doesn't need to be more than four hours. Tere are many less time-consuming golf experi- ences to ft schedules. 2 Course difculty: On many newer courses, average players cannot enjoy the experience as much as more ad- vanced players. 3 Price: Public perception is that a round of 18 holes costs two to three times more than the actual $28 average. In the efort to improve consumer en- thusiasm for the sport, the frst step was getting golf superstars (like Jack Nick- laus) involved with testimonials. "We wanted to let all our professionals know that, while important, the traditions of golf must not serve as barrier to future success of the game," Marlatt observes. OTHER INITIATIVES: >> Pilot programs that promote big- ger cups rather than the traditional smaller cup, improving pace of play and the overall experience. >> A "Tee It Forward" campaign that es- tablishes forward tees, making holes shorter for new and average players. >> Many near-golf experiences aimed at Millennials who are video-game savvy, allowing younger players ac- cess to indoor simulators and making the game a more social experience. "We had to help people realize that the outcome of fun was more than just their score," Marlatt says. "If we can improve their performance and enjoyment, they're going to play more golf." To quote Marlatt again: "We want to see the future of golf more diverse and resemble more the face of of America. To prosper, the game must evolve beyond a bunch of rich white guys. Te game can ofer so much to our youth, women and minority populations." What that meant was retooling the organization's training and development program to its apprentices, in a way that is revenue-, sales- and marketing-centric and to make PGA professionals real- ize that, frst and foremost, the game is about the customer. "We completely changed our entire golf management apprentice train- ing program to address every aspect of revenue drivers and leadership qualities," says Marlatt. "We accomplished this using a blended digital strategy along- side our instructor-led approach. Tis allowed us an opportunity to stay con- nected with each of our four generations in the workforce today. For our PGA pros, we used the same approach from an online distance-learning opportunity, and we made sure we had subject-matter experts on the ground in all geographical regions facilitating the online learning." Player development regional managers were hired to work closely with industry stakeholders to recruit new golfers. On- line education has been made available to all 41 of the PGA's Sections so that the pros can enhance their business skills to support their local marketplace. And every program was built to be customiz- able and adaptable. "Since golf is a very threatening environment to new players, we had to emphasize the qualities for what a welcoming environment is," Marlatt con- tinues. "Golf was set up around the idea that you should know what you're doing before you get to the frst hole. We had to make a very signifcant efort toward educating our all our consumers and professionals. We know that women and children want to feel safe and comfort- able in the environment, and this must begin at the parking lot to the golf shop to the course. "We know that the industry's down- turn didn't happen overnight, and a rescue won't happen overnight, so it's got to be a sustainable approach that's continuously assessed — but we do need everybody involved." PGA of America is a frst-time Learn- ing! 100 honoree. 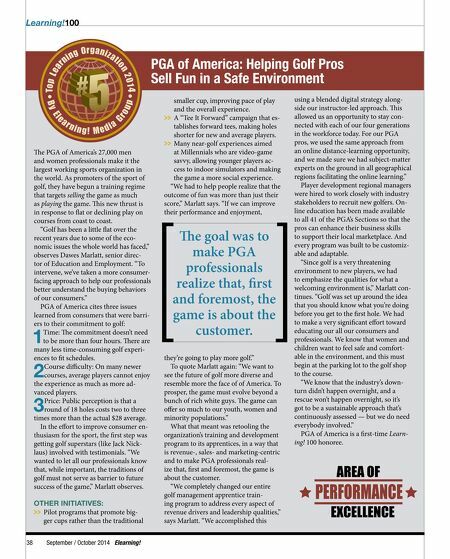 AREA OF EXCELLENCE PERFORMANCE Te goal was to make PGA professionals realize that, frst and foremost, the game is about the customer.